I have been stepping out of my comfort zone lately... In more than one way. And I have proof. Photography proof. And knitted items proof. So let's get to it, I have been so looking forward to write this blog post!!! A couple of weeks ago, I told my husband how I was dying to ask some people to model for me but I did not have the courage to approach them. My husband then told me about a documentary he had seen about a photographer who wanted to shoot some pictures of a village where illegal plants were grown. The photographer got over his fear, approached the villagers, asked for permission to shoot pictures and ... got a "yes" for an answer. "Get over your fear, Nancy", my husband gently advised me. "Step out of your comfort zone and do your thing." 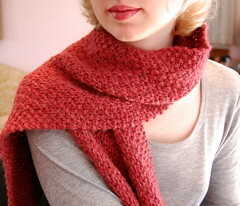 Regular readers of this blog will remember that I designed "Adrienne" back in December of last year. 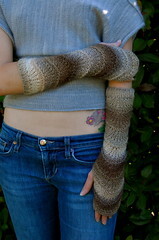 Fingerless glove "Sally" I also designed back in December of last year. We made lots of other photos that day. Keep on checking back! 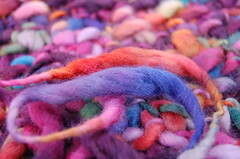 I usually work with finer gauge yarns and more than once, I cringe just looking at chunky and bulky gauge yarns. Needle size bigger than US11? No way! But guess what... 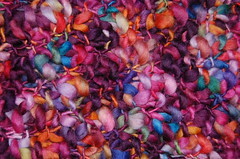 I have been working with super bulky yarns and needle sizes US15 and US19 and I simply LOVE it! It's freakin' HUGE yarn! I cannot believe I am actually working with it! 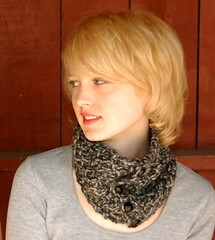 You might wonder with what yarn I made the cowls. Hold on, be patient, more details will follow. I planned on having the cowl patterns and Tristan's scarf pattern to be issued in this week, but alas, I have been so busy lately and just did not have the energy to do any knitting let alone WRITING a pattern. I will be traveling to Pittsburgh, PA, next week and that means no work in the yarnshop for 2 whole weeks. That does not mean my hands will be idle, though. I will be working hard on writing out patterns, editing pictures, getting everything in a pdf file, going to Kinko's to print out patterns and what not. And this time, I am actually going to ask money for all of my hard work! Submitted by lcbowden on Sat, 11/22/2008 - 08:44. 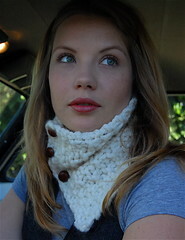 Nancy, I love your original patterns..can't wait to try them, especially the seed stitch scarf. When will the patterns be available. Count me in!! And keep on designing!! Renna, thank you so much..! Submitted by Nancy Ricci on Mon, 09/22/2008 - 02:00. Submitted by renna on Sun, 09/21/2008 - 16:13. Nancy, the pictures are fantastic. The girls both look so natural wearing your lovely knitting. I'm so happy to see you stepping forward. Talent such as your's is destined for big things! Wow, Le, would you really??!! Submitted by Nancy Ricci on Fri, 09/19/2008 - 06:10. I would LOVE you to do some model work for me in the future. Let's talk about it some more when you stop by the store. Thank you so much, Le! Submitted by leking3 on Thu, 09/18/2008 - 23:00. If you ever in the future are in need of a model I would love to do work for you! I have been in the bus now for 28 years! Submitted by Nancy Ricci on Thu, 09/18/2008 - 14:15. 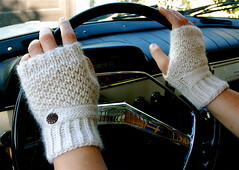 The big bulky thick and thin yarn is from the brand Colinette and is called "Point 5". Of course I did not save the label so I forgot the color number. Good luck with your tubey. Change the pattern and give it your own spice! Submitted by onepapillon on Thu, 09/18/2008 - 03:33. I really, really, really need to have a huge stash of that variegated bulky yarn! I am not usually big on big yarn but I LOVE this stuff! Please tell me the name! Also want to tell you that you were an inspiration with your short sleeve tubey knit top. I'm doing my own version, but got the nerve to change the pattern from YOU! Thanks! Submitted by Nancy Ricci on Wed, 09/17/2008 - 02:33. Thanks, Vanessa! You would like to try out the patterns, for reals..??! That really makes me happy! Submitted by Vanessa216 on Tue, 09/16/2008 - 11:13.
these are beautiful (as are your models!) can't wait to try the patterns!